Designer Concepts provide a brilliant assortment of tile options for your home. Request your free design catalogue for inspiration today! Discover the multitude of styles available in the bathroom tile collection. With heritage designs and sleek dark tiles if you’re looking for modern styling. Be sure to take advantage of the Designer Concepts interest free tile credit! Create the perfect environment for you to host friends and family. With the range of wall tiles or find a unique style of tile to bring your kitchen to life! Shop for tiles and get 5% off orders over £200! Explore the range of wood effect tiles, ideal if you’re looking to create an open plan design linking living space to kitchen space. Designer Concepts provide a free tile sample service so you can try before you buy! browse the huge collection of tiles and choose up to 3 free samples including free delivery! 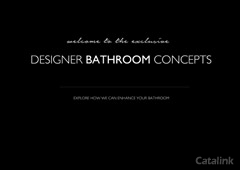 Request the Designer Concepts Catalogue today for inspiration on tiling for your home! Next PostNext Vendes Flash Sale – Everything You Could Need!